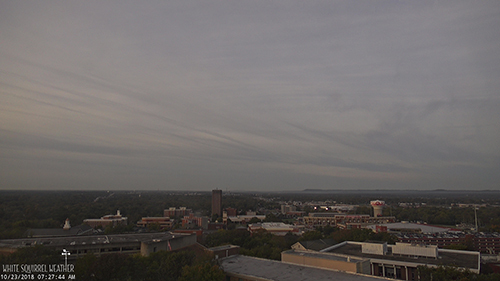 Welcome to Today@WKU, the daily newsletter from WKU Public Affairs, for October 23, 2018. WKU Forensics Team second in Central Missouri debate tournaments: The WKU Forensics Team’s eight debaters placed second in overall debate team sweepstakes at two tournaments hosted by the University of Central Missouri in Warrensburg, Missouri, the weekend of Oct. 20-21. On Friday (Oct. 26), the team will host a free public showcase in WKU’s Faculty House at 6:30 p.m.
WKU alum honored for 2018 WKU Libraries Open Access Hall of Fame: WKU alum Daniel Pulliam is the 2018 inductee into the WKU Libraries Open Access Hall of Fame, recognizing him for his thesis “Effect of Student Classroom Cell Phone Usage on Teachers” which was submitted in Spring 2017 to the university repository TopSCHOLAR®, and has been downloaded over 44,000 times from 181 countries. WKU Week in Photos: Oct. 15-19, 2018: Check out the latest installment of WKU Week in Photos by Clinton Lewis and Bryan Lemon of WKU Public Affairs on WKU's Facebook page. Men’s golf: Tops, Easton Lead Pinetree Intercollegiate as WKU Fires Best Round in 12 Years: In just his second tournament this season, WKU's Stuart Easton found his groove. That powered his team to its best round in 12 years. The Hilltopper Golf senior fired a career-low, 7-under 65 in the second round at Kennesaw State's Pinetree Intercollegiate, helping him hold the outright lead with an 8-under 136 total (71-65) with one round to play. WKU also holds the team lead with a 570 total, including a 12-under 276 in the second round. That's the program's best single round since the Tops also shot a 276 at the Wyoming Cowboy Classic in 2006. Men’s basketball: WKU Hosting #SellOutDiddle Season Ticket Call-A-Thon with WBKO: As part of its #SellOutDiddle campaign, WKU will host a Call-A-Thon in conjunction with WBKO-TV today with a special deal on WKU Hilltopper Basketball season tickets for the upcoming season. The Hilltoppers will appear on WBKO programming throughout the day. Welcome to the Bone Room: Even before its death, this yellow stingray was like a ghost. The ocean dweller haunting the waters of North Carolina down to Florida and the Bahamas and Caribbean, would glide across the seafloor or vanish into the sand with its mottled tan skin—sneaking up on nearby prey. But its disappearing act also works on humans. When a swimmer wading in shallow waters accidentally steps on a hidden yellow stingray, the creature defensively swings a venomous barb, or spine, on the top of its tail and stings the leg. It’s an intricate movement—one that WKU biologist Steve Huskey goes all the way to the bone to understand.